As we prepare for 2019, let’s take a look back at some of the top moments from this past year in our schools, in the community and in Gloucester Township. 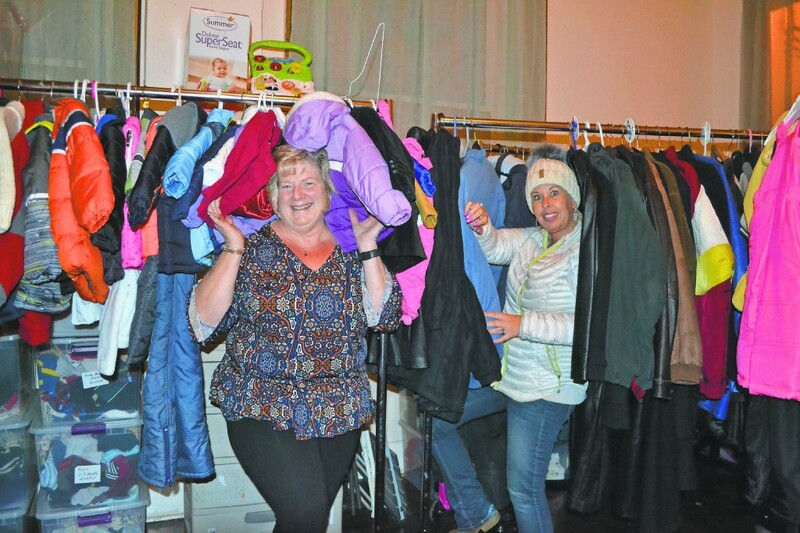 Co-partners of the Unforgotten Haven, Jeanne Rodrigues and Michele Gambone, sort through the nonprofit’s winter clothing donations last season. The abundant amount of contributions, averaging about 100 to 150 bags coming in per day, lead to the need for a second storage building. Another year is coming to a close, and Gloucester Township residents have plenty to look back on from the municipal and school levels, as well as community events. Camden County’s Addiction Awareness Task Force was formed four years ago, and continued to seek ways to both promote awareness of the opioid problem, as well provide further resources for those in need of assistance. Camden County Freeholder Louis Cappelli said the task force was formed after the board recognized the need for additional treatment services for residents. He also said the task force admired the Project SAVE program created in Gloucester Township, and that he would like to see something similar be replicated at the county level. Project SAVE has several aspects to it, with one key component being adding a licensed drug and alcohol counselor in the courtroom as a way of providing assistance for lower level offenders to stop the problem before it gets worse. Statistics provided by the township show that since June 2014, the SAVE advocate has offered services to 158 individuals to help address and solve their addiction. Of the 158 individuals, 80 percent have engaged in the project, and more than 70 percent of people who have seen the project to the end have not been arrested since completing the program. Cappelli said the board was looking to create a pilot program, which was announced approximately a month later. All 37 municipalities in Camden County have the opportunity to join by the end of 2018, and municipalities continued to trickle in joining the program. In January, the Unforgotten Haven announced it was seeking a second location to hold donations. The Gloucester Township-based nonprofit was established officially in April 2015 after the two original members of the organization began collecting donations for a family on their own. After 26 projects and 34,000 Facebook followers, the nonprofit was looking for a second location in Gloucester Township, saying it appreciated the support from Mayer over the years. The second space was intended to allow repurposing the original building, transforming the Black Horse Pike site into a place to shop and relax. The Blackwood-based nonprofit continued to offer support close and far, when in November it prepared to send a 54-foot tractor trailer to the Florida panhandle to support those affected by Hurricane Michael. Volunteers with the organization gathered supplies, including diapers, food, drinks and medical and hygiene supplies, to send to Florida. 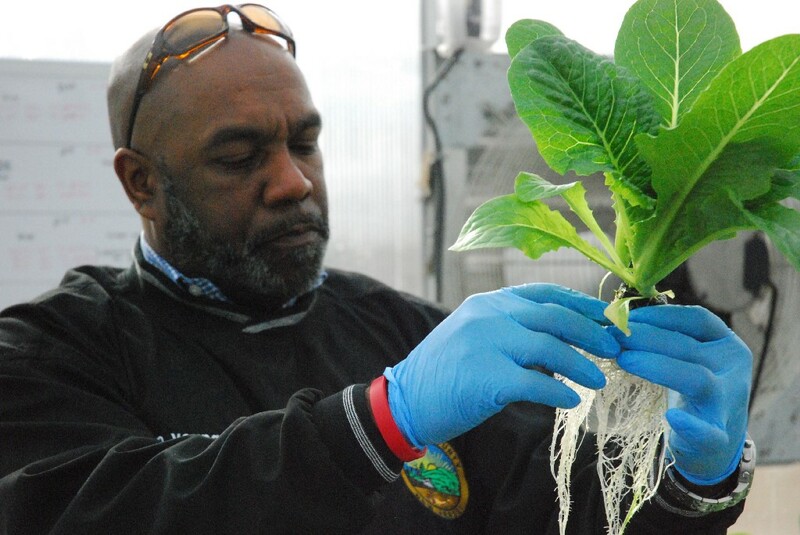 Camden County Freeholder Jonathan Young examines a lettuce plant that is grown in the hydroponics greenhouse without soil, exposing the roots. Sustainable Camden County grows many types of food in the greenhouse to assist organizations in the South Jersey and Philadelphia area. Two E. coli scares across the United States, including the most recent one in November, caused much of the county go without lettuce for a period of time. While the problem batches were later traced to Northern and Central California, certain organizations faced shortages of lettuce from reliable outlets. Luckily, Camden County’s Office of Sustainability grows different types of lettuce, including romaine, as well as tomatoes and other plants in its hydroponic greenhouse, located in the Blackwood section of Gloucester Township. The county partnered with the Philadelphia Zoo earlier this year to provide additional food for its animal nutrition program, helping feed many different types of animals under care at the zoo, something that came in handy. The hydroponic greenhouse practice is to grow plants without using soil, but instead by using a myriad of different growing practices with nutrients and a water reservoir mixed with nutrients. The practices helped provide lettuce to both the Philadelphia Zoo and nonprofits in Camden as well during the national scare.